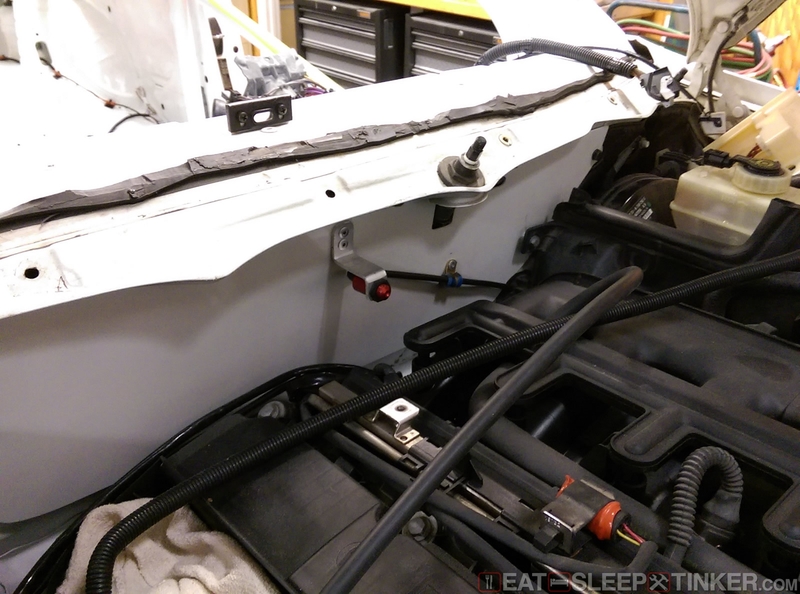 Eat, Sleep, Tinker.Spec E46 Build Part X: Safety & Interior - Eat, Sleep, Tinker. Much of the safety aspects of this Spec E46 race car build were covered in Part VII Roll Cage, so I’ll just be covering the final touches and refinements. 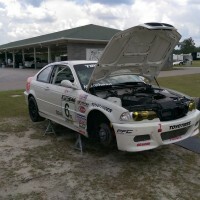 I intended for the car to be legal in both NASA and BMW CCA Club Racing, so a few additions such as a center net system were necessary. For the most part, safety equipment legality is pretty universal as long as you are running approved (FIA or SFI) gear. For a seat I wanted a head restraint (halo) style bucket. I went with the Racetech 4119 based on the good reviews and the nice addition of a backside cooling air port. It’s also available in tall/wide, nice for my 6’2″ 200lbs frame. For floor mounts I used VAC Motorsports matrix style aluminum mounts, which are fairly standard among this level of racing. 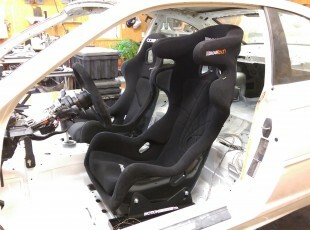 For side mounts I went with Motion Motorsport’s innovate competition seat brackets. These brackets allow for infinitely adjustment and are asymmetrical left and right to allow close mounting to the transmission tunnel. I opted for Schroth Profi II 6-point HANS belts for my harness. These belts have 2″ lap webbing for better fit and can be set as pull-up or pull-down operation. I tried both ways and decided pull-down was easier to get a tight fit when in the seat. The window and center (right side) nets are both Teamtech mesh nets, which were easy enough to install. Fortunately my window net doesn’t interfere with seeing the side mirror, and the even if it did, the mesh is certainly easier to see through than grid webbing. The window net is mounted using a Joe’s Racing kit, which uses nice billet aluminum parts. 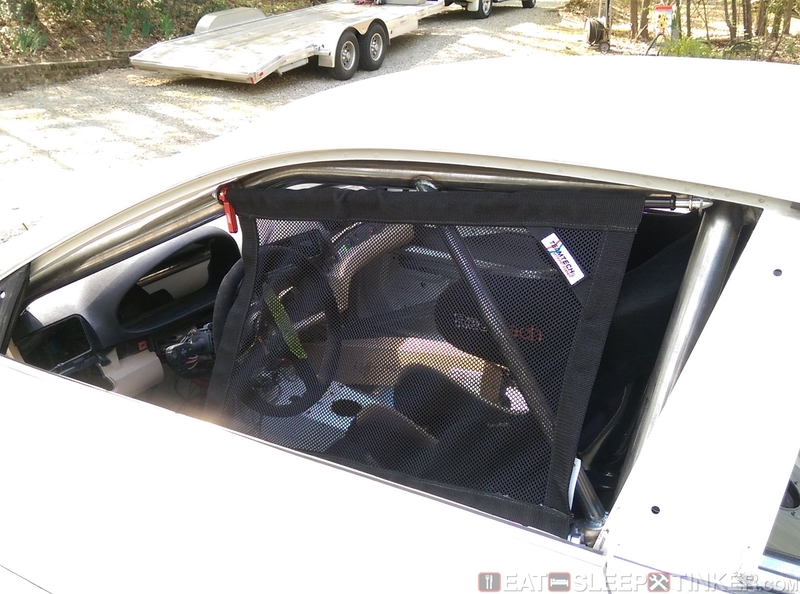 The center net is secured to the dash bar, running through a small slit in the dash and held from sliding on the bar by a 1-3/4″ aluminum split collar. The steering wheel is a MOMO Mod 78 350mm race wheel, mounted using an NRG adapter, NRG short quick release, and NRG 1/2″ spacer. The NRG products are hard to beat for the money, using all aluminum parts and anodized matte black. The quick release uses spring loaded ball bearings in a unique pattern that only allows the wheel to go on one way and has a much tighter fit than I’ve seen with spline style releases. 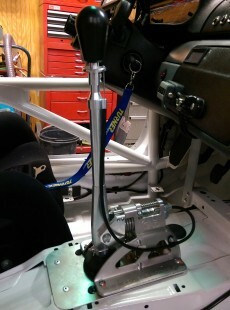 Shifter action is taken care of by a CAE Ultra Shifter. This is a very impressive piece, made in Germany from quality aluminum and stainless parts. The shifter has a self-centering action and adjustable stops to keep from pushing the shifter further than the transmission forks can go. It also has a lock-out for reverse, making it impossible to accidentally shift into reverse. The shift selector rod is also from CAE and can be adjusted in length and rotation. The setup requires a bit of tuning, but once setup properly it is absolutely the best H-pattern shifting action I have experienced. The pedals remain stock, though I did remove the rubber covers. For grip I added some textured grip tape to the brake, clutch, and dead pedal. 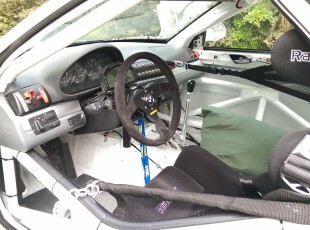 I also replaced the split plastic bushings on the clutch and brake pedals with Delrin units from Rogue Engineering. These bushings fit much tighter, necessitating a little sanding for the right amount of friction. The result is much less side to side play. 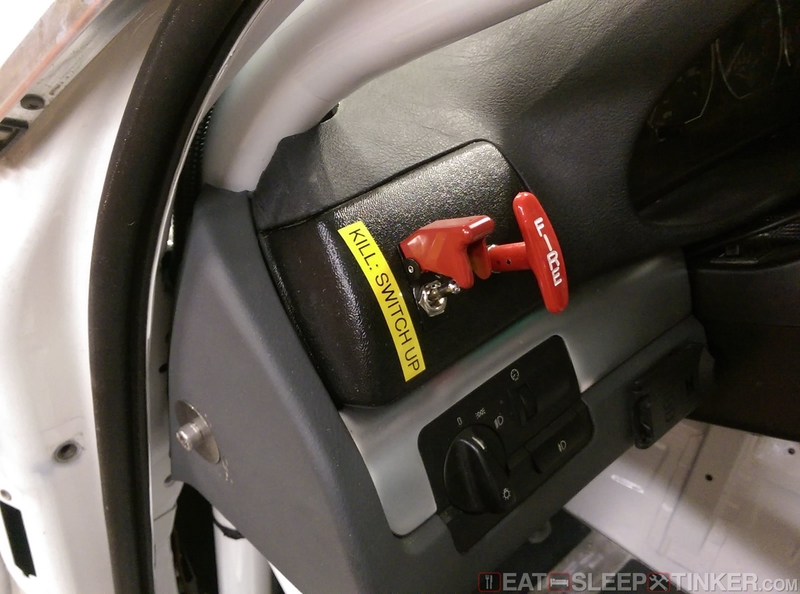 To keep the clutch from overextending and cut down shift times, a BimmerWorld mini hockey puck clutch stop was installed. 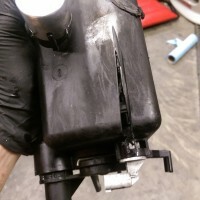 The OE stop is very small and the plastic clutch pedal can inadvertently go beyond it. Finally the fire system was installed. I got lucky and found an unused SPA 4L AFFF system, which just needed re-certified to use. The system is fairly simple, using push on connectors and tubing with an aluminum wall, so bending it shape is very easy. I mounted the bottle behind where the passenger seat would be. Because the cage main hoop foot plate was interfering, I mounted the bottle up on two pieces of 1/2″ square aluminum tubing. The plastic tank cradle is riveted to the square tube, which in turn is riveted through the floor. The fire suppression system lines run from the tank forward along the transmission tunnel, split between cockpit and engine bay nozzles. There are three nozzles in the cockpit, one on the tunnel facing forward, one pointed at the footwell, and one in the dash pointed at the driver’s torso. The engine bay line splits, one to the left which has a nozzle pointed at the fuel rail and one to the right pointed over the headers towards the front. 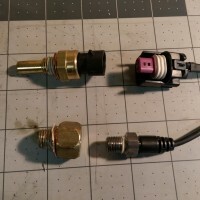 I will probably add an additional one to point down into the engine towards where the headers are, just as a precaution against an oil fueled fire. 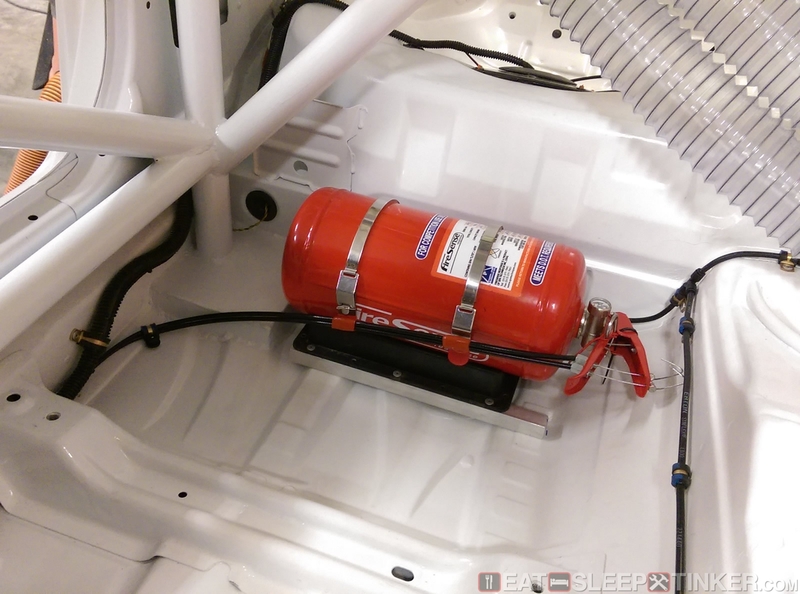 I used two 12′ T-handle pulls for the fire system. The handles terminate at the corners of the dash, so they are easily accessible from either inside or outside the car by a corner worker. They are also located next to the emergency kill switch for easy activation of both in a crash.